I could begin and end with the simple statement that meteorites come in all sizes and all shapes and make this a very short installment indeed. Yet, that statement would nevertheless be true. Meteorites come slamming into the atmosphere and break up into nearly any shape and into pieces from dust to the largest weighing many tons. But, like most things it is more complicated and things happen during the flight through the atmosphere that alter them into very distinctive objects. They maybe any basic shape however, the surface melting by ablation in their flight will soften the edges and round them and sculpt them so that they look like nothing other than meteorites. Most of the time the piece of meteoroid will tumble during flight and they will be uniformly melted on all sides. They will develop pits on the surface where material has been ablated away. The pits are called thumbprints or to use the scientific name regmaglypts. On a far less often occasion a piece of meteoroid will pass through the atmosphere in a stable flight with only one side facing into the atmosphere. This results in a meteorite that has most of its ablation marks on only one side. That is the side facing the ground. These meteorites which are referred to as being oriented in shape can have fantastic radiating thumbprints that flow out from the center of the incoming face. The melted material swept away from the front surface can pile up and cool on the back side often leaving a raised lip and bubbles on the back of the meteorite. This is a small Chelyabinsk meteorite that is nicely oriented. It fell into the atmosphere with only the face shown being ablated. It developed a nosecone shape with grooves cut around the circumference. This is an unclassified meteorite from North Africa which is not oriented. I has a nice shape and has good remaining fusion crust, Note the thumbprints on the surface that are quite typical of those found on stone meteorites. Regardless of whether the stone is an oriented meteorite or one with normal ablation on all the surface they will be covered with fusion crust and have rounded, smoothed off edges. Now it is not uncommon for stones to break up more than one time during flight. So there can be surfaces that look broken and yet are black in color appearing to be fusion crusted. This is what is often referred to as secondary fusion crust. The stone broke up high in the atmosphere and was ablated smooth, then broke again. This second break up occurred much lower in the atmosphere. The stone was still traveling fast enough to continue melting on the surface. However, it did not have time to melt enough to remove all traces of this second broken surface. What is seen is a fusion crust often thinner than what is on the rest of the meteorite and a bumpy surface that retains a little of the form of the broken rock surface. 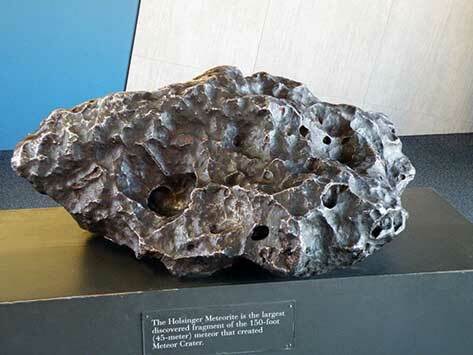 But, with all that said meteorites still are usually smoothed off on the edges and rounded on the corners. This is all true regardless of size. So even though a particular stone is blocky in shape it will have blunted off edges and corners. On occasion a meteoroid will be able to make it to the ground intake without breaking up. The result is obviously a single stone that can be recovered. Much more often a meteoroid will suffer an explosive break up during its flight through the atmosphere and hundreds if not thousands of pieces will result. In addition to these pieces a tremendous amount of dust will be produced by the explosion. Generally, it is impossible to recover the dust. The explosion happens up at altitudes of many miles. The wind will distribute the dust over a vast area and it may be days or weeks before all of the dust settles out. The next size particles created by the explosion however, can be recovered. 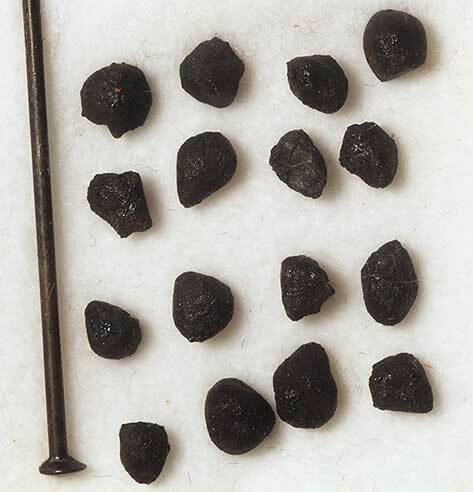 These are the micrometeorites. These are meteorites that are in the range of just a millimeter in size. They require a few special techniques to recover but are a fun project if you have the patience to attempt it. This is a group of tiny Chelyabinsk meteorites that range in weight from around 25 milligrams to under 100 milligrams. Note the pin as a size reference. Micrometeorites are not just produces during large asteroid entry events where an explosion of the cosmic body occurs. Micrometeorites by the millions are produced as small pieces of rock hit the atmosphere every day. But, these can not be recovered as easily as the tiny individuals that accompany the larger stones of atmospheric explosion meteorite falls. They fall one at a time randomly everywhere. When the Chelyabinsk event happened thousands of meteorites were created many of which are quite small. But perhaps millions of smaller meteorites were created that can not be found visually lying on the ground. They are too small but they are there in the soil now probably to never be recovered. From the small size micrometeorites the size goes up every other size you can think of. Examples are sizes such as small pebbles, marbles, tennis ball size, football size, and even larger size pieces. The size range continues up to larger meteorites which weigh many tons, finally to the largest; the Hoba meteorite which weighs over 60 tons. Cosmic bodies far larger than 60 tons enter our atmosphere regularly. Since most are made of stone which is brittle they can not survive the pressure exerted upon them by traveling at tens of thousands of miles per hour. They are squeezed and squeezed until finally their structure fails and an explosion occurs. Some asteroids; a smaller percentage are made of metal and they can sometimes take the pressure and survive all the way to the ground. If they are big enough they will retain a portion of their cosmic velocity all the way to the ground too. If they do they explode on impact and create a crater. But, again no great mass of meteorite survives. For example, an asteroid of about 50-100 meters across created Meteor Crater in central Arizona. Yet the largest surviving piece is far less than a single ton in weight. Pictured here is the largest fragment ever found of the iron asteroid that carved out Meteor Crater in Arizona. It is possible that there are larger meteorites than Hoba that have not been found. The shape of Hoba with its flat upper and lower surface may have resulted in it landing in a manner that kept it from burying itself to great depth. Others many not have been so fortunate. Larger meteorites than 60 tons may have reached the ground and are simply buried beyond our ability to find them. Metal detectors have been around for about a hundred years and practical for use for a far shorter time. 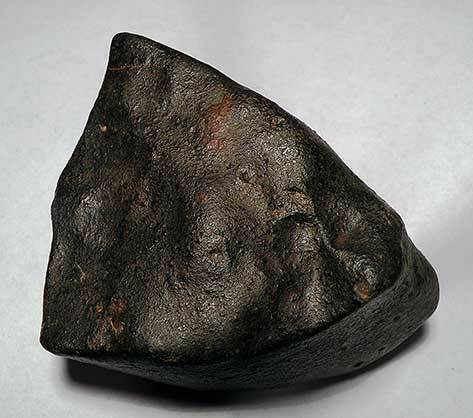 Most large meteorites were found before metal detectors as a result of farming. They were hit by plow blades and moved by farmers from their fields. The Earth is a big place and it takes time to search deep with a detector. Maybe larger meteorites will be found as we continue to use and explore for resources. The future will tell.